Originally created to celebrate the Paris-Brest cycle race, this delicious lemon based dessert is made from choux pastry and is perfect for anyone with a sweet tooth. You will need a baking tray covered with non-stick silicone coated baking paper. Draw eight 6cm circles on the baking paper. 1) Preheat oven to 170c fan. 2) In a medium-sized saucepan, heat butter, water, salt and sugar and bring to boiling point. 3) Add the flour and mix vigorously with a wooden spoon. 4) On a medium heat cook the paste for about 3 minutes, stir it constantly. 5) Transfer the pastry to a bowl and allow to cool slightly. Once slightly cooled, add about two thirds of the beaten eggs and beat with a wooden spoon, or it’s much easier to use a hand whisk. You are looking for a smooth thick glossy mixture that falls very slowly from a spatula. Add more egg a little at a time until you reach the right consistency. The mixture should hold it’s shape when piped. 1) Using a piping bag ideally fitted with a French star nozzle (about 15mm diameter), pipe the choux paste into a circle about the size of a doughnut onto the non stick baking paper using the 6cm circles as a guide. 2) Sprinkle the tray with water then bake in the centre of the oven for 30 minutes. The choux should be well coloured and crisp. If it isn’t, bake for another few minutes. Don’t be tempted to open the door before 25 minutes has passed as the choux could collapse and deflate. 3) Place on a wire rack to cool. 4) Whisk the cream, icing sugar and vanilla until soft peaks. Place in a piping bag ideally fitted with a 10mm star nozzle. 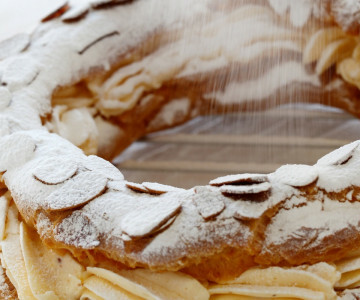 5) Assemble the Paris Brest. Cut each wheel in half so that you have two rings. Put about 1 teaspoon of lemon curd into the bottom half. Pipe the cream over the curd and place the top half over the cream. Dust with some icing sugar.